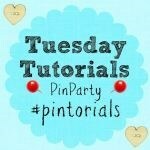 Welcome to Week 30 of the Tuesday Tutorials Pintorials Pin Party! We are at the end of August now and next week both children are back to school. I can’t wait for them to go back so I can properly relax! Two weeks ago, I had made my first DIY magmatic chalkboard video and this week, I decided to feature three DIY projects! First is from Adventures in Wunderland. Her husband used pallets and built a couch for their back patio! Secondly is from Mini Monets and Mommies who built a kid’s train table using cardboard. The final tutorial for this week is from Planet Smarty Pants who made her own bath stones. Don’t forget to pop by to take a look at Kate (DIY Stationery), Anna (Junk modelling) and Hodge’s (H craft) blogs to see who is featured this week.